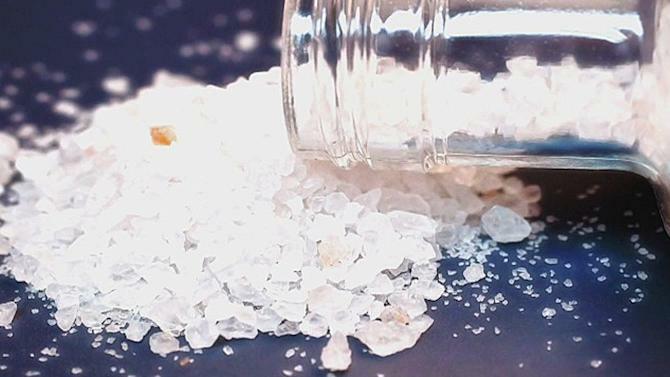 The hottest designer drug to hit the underground market is a cousin of bath salts known as flakka. Placed on the U.S. list of illegal controlled substances in 2014, flakka’s popularity has surged, especially in Florida, where it arrives in droves from China through the mail. The drug has reportedly also shown up in Ohio, Texas and Illinois. Other states, such as New York, have issued warnings about it. Flakka is part of a chemical class of drugs called cathinones, and it’s designed to mimic the stimulative effects of the cathinone found in the leaves of the khat plant chewed in some parts of the world. Flakka — its chemical name is alpha-pyrrolidinopentiophenone, or Alpha-PVP — comes in the form of white or pink crystals that can be swallowed, snorted, injected or vaped. “Vaporizing, which sends the drug very quickly into the bloodstream, may make it particularly easy to overdose,” the National Institute on Drug Abuse warned in April. The term flakka apparently comes from the Spanish slang for a slender and attractive woman (“la flaca”). The drug is also referred to as gravel because its white crystal chunks have been compared to aquarium gravel. The drug has effects similar to MDMA, also known as ecstasy or Molly. It acts as a re-uptake inhibitor of the neurotransmitters dopamine and norepinephrine, leading users to feel “excited delirium.” Some users can have hallucinations that result in violent behavior, or experience spikes in body temperature (up to 105-106 degrees Fahrenheit) and paranoia. In addition, the drug can cause muscles to break down, a result of higher body temperatures, leading to kidney complications and, potentially, the need for long-term dialysis. Flakka may be more addictive than meth and some have said it can be more dangerous than cocaine because it’s difficult to control the exact dose an individual takes. A small overdose can lead to extreme symptoms, including death. The effects of the drug can take days to wear off. Plus, flakka is cheap. A dose can reportedly go for $3 to $5. On the street, one kilo can cost $50,000, but ordered online from China — where it isn’t illegal — one can go for as little as $1,500, according to experts cited by Reuters. As the drug becomes more popular, stories and videos showing the strange behavior of alleged users are cropping up — and news outlets have been rushing to share them. A girl in Melbourne, Fla. ran through the street screaming that she was Satan while on a flakka trip. A man in Melbourne ran naked through the streets claiming to be God before “committing a sexual act on a tree.” In Fort Lauderdale last month, a man high on flakka impaled himself while trying to scale a fence around the police station. Last year, authorities in Florida’s Broward County recorded 190 incidents involving the drug, the news service reported Wednesday. In just over four months this year, the number of incidents had already climbed over 275. Official seizures of synthetic drugs, the vast majority of which are of flakka, overtook cocaine as the most common drug in the county’s crime lab reports over the first quarter of the year.